One word, delicious! We have come to expect a great quality product as usual you delivered. Already on the websites for comments & our opinion has not changed in 4 years! Great quality, Already looking forward to the next order! Manna Catering has tried all kinds of beef. Touchstone Angus is the BEST Grass fed beef we have tried. Our customers love it. The beef was fantastic. We are really enjoying it. Best beef out there. We've yet to taste its equal. This is our 3rd side that we've ordered from Touchstone if I'm not mistaken and short of it being delivered and stacked in my freezer for me, I can't imagine the experience being much better. Butchers are sometimes quirky folk but Elizabeth Locker is the best we've ever dealt with. I personally drove to your ranch on my way back from ND and was very impressed with what I saw. All my communication with Brad has been very positive with no problems. Please keep up the great work. It was super easy. In fact, almost too easy. The beef is great! We'll definitely order again. We coordinate a group food buy/drop here in our area have shared your information with our group. Hope to get the word out about you all. We have ordered grass fed beef through the years from various ranchers in multiple states. You all are, by far, the best! Thanks so much for all you do. Thank you for last years beef. It was our first time ordering from you and the process was easy and the beef was spectacular! I just wanted to send a belated note to you to let you know how delicious the beef is we got from you in January! My family, and those in our cowpool, are so happy with the purchase. Brad, first of all I want to thank you for doing what you do, in a world focused on mass production it's nice to know that there are folks out there like you doing things the right way. This was my first time ordering grass fed beef and I found the ordering process simple and the beef extremely flavorful. Naturally raised beef is important to me and I will continue to support this type of food production in the future. I can't tell you how much we have enjoyed the beef from your ranch. It is truly the best we have ever had. I can't believe that even my kids have started complaining when we eat beef out in the world..they think it doesn't taste as good. Brad, The beef we bought from you has been outstanding. My wife who has not eaten red meat in 20 years (because of the antibiotics, etc..) tried it and loves it. The only beef she will eat is from our freezer. All of our friends that have tried it think its the best they have ever had. That brings me to this; I have at least 3 friends, probably more, who want their own 1/4 next time..
Brad, We have received our meat yesterday and I wanted to thank you for this great product!!! I made a stock with bones and my 2-year old bit my fingers off :) I was wondering for the next time if we could order half a cow without processing as my husband got so excited and wants to do it himself?! I am so happy to see that there are traditional methods that are still in place!!! And we can enjoy your healthful meat! I am in healthcare field and do not subscribe to current USDA recommendations and believe food must be as natural as possible and good fat is the key!!! I know current guidelines are not supported by research and were forces by political lobbyists. I believe in people like you and hope you take over!!! Again, thank you so much! At first I thought to use tallow for home made soap, but now when I see it -NO!! !- I should eat it!!! We can not thank you enough!!! Your communication was excellent too and you made the whole process very easy to understand and follow. Elizabeth plant did a good job too and followed my specs. Thank you so much for the great job that you do! Brad, We just wanted to send you a quick message to say we picked the beef up this Saturday and could not be happier! After cooking up a couple of the steaks and a package of the burger we already are looking forward to our next order. Simply put, the meat is far superior to anything than can be found in stores & at a better price to boot! This past January I had a first in that I ordered beef over the internet and another first in that I ordered grass fed beef from Touchstone Angus Ranch run by Brad James. I am very pleased that I chose Touchstone in that being a novice Brad walked me through the entire process from choosing my beef cuts to pick up of the beef in Elizabeth, Colorado. I had been warned that the beef because it was grass fed would be somewhat tough and I may be unhappy with the purchase. Thus far I have found this to be entirely not true. I have had two cuts of steak and have found both to be more tender and more flavorful than store bought beef. Granted most store beef is labeled choice and not prime but the steaks I have enjoyed would rival prime cuts I am sure. Also the hamburger has been of excellent flavor and I love the fact that it is a low fat package of meat. I dropped off some beef for my son and daughter in law in Denver on my way home and while he had just bought part of a quarter of grain fed beef from the Midwest he declared the Touchstone beef more flavorful and tender than the grain fed beef. Because of the way I was treated by Brad at Touchstone and because of the quality of beef I am sold on the grass fed no antibiotic beef I have purchased and look forward to my next purchase in the fall. Thank you Brad. This was our first time buying from Touchstone and we are hooked! The whole transaction was very smooth, great communication, and Brad was extremely helpful and knowledgeable. And the beef is fantastic! After eating something so delicious and nutritious, we will never buy from any where else. It feels good to be feeding my family beef that is pure and extremely healthy instead of the mass produced "pink slime" that is out there. Corporations and the pharmaceutical companies do not care about the consumers, just the money. Brad James truly cares about all of his costumers and takes pride in their beef. Thank you Touchstone! About 13 years ago, we thought my wife had become allergic to beef. After two years of avoiding beef all together, we decided to try organic beef. It turned out that my wife, who is allergic to antibiotics, wasn't allergic to beef, but to the ever higher concentrations of antibiotics coming through in the beef. We found out about your operation through friends and have been enjoying your beef for over five years now. 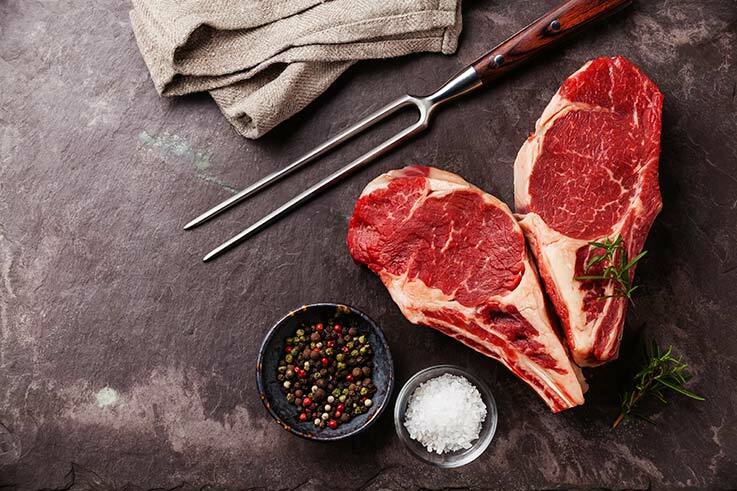 Not only are we able to eat beef as a family, we eat more because it just tastes better and we cook with cuts that we wouldn't have thought of purchasing from the store. This year was our first year ordering directly from Touchstone. We found the process to be incredibly easy, and our family now has a better understanding of where our food comes from as we made the choices about how to have the meat processed. Our sincerest thanks for your dedication to producing healthy, sustainable food. I have now ordered twice from Touchstone. My family of four loves it. I especially like how each selection of beef is individually wrapped and LABELED! It is very tasty and cooks very nicely. Can't wait for my next order. This was our first year buying a quarter cow, and we will be buying one from Brad every year now. The beef is noticeably tastier than grocery store beef and comes with the piece of mind knowing that it is grass fed, responsibly raised, and from one healthy cow rather than "who knows what" from the grocery store. We recommended him to our neighbors who had never done this before either, and they now also have a quarter cow hanging out in their freezer - it really is that easy! Great taste and great customer service. My new favorite steaks are Touchstone Angus. This is my third year getting grass fed beef from Touchstone Angus. We started getting grass fed beef because it is healthier than grain fed beef. I thought there would be a sacrifice in the flavor, but the beef we get from Touchstone Angus is delicious! An added benefit is the low price! Thank you Touchstone Angus for providing such good quality beef to us year after year! We have been getting this beef for several years and have become spoiled. Now we only want beef with exceptional flavor. It is great to be able to get beef raised properly at a price we can afford. It's also good to know that it is processed at a small clean facility. The folks there, as well as the rancher, have been great to do business with. The Touchstone Grass fed beef was/is delicious; enough fat for flavor but in general low fat yet very tasty. It was easy to deal with Touchstone and everything happened just as promised. We have been purchasing the outstanding grass-fed beef from Touchstone for the past 10 years, and we will NEVER go back to buying it anywhere else, especially the grocery stores. We are always so sad and disappointed when we run out and have to buy our beef in a grocery store or club warehouse. I can only say there is no comparison between the Touchstone beef and the other beef out there. I know exactly where the beef is raised and coming from, and where it is processed. I understand some of our U.S. beef sold in stores may come from out of the country (China). The taste, texture, and tenderness is so delicious! Even the hamburger, which I thought wouldn't be much different, really is just the best! I would say that everyone must try Touchstone; I promise that you won't go back anywhere else! Oh, and I believe the cost is the same or less than grocery stores or Costco! Delicious, reasonably priced, and so nice to have a stocked freezer full of beef available whenever you need it! We're not big beef eaters, but when we do, we prefer healthy grass fed beef. We bought a quarter from Brad at Touchstone Angus and have really enjoyed the quality product. It's great to have a variety on hand when the needed. When we cook up a pound of the hamburger, we've been impressed with how little fat there is drain off, sometimes there is none and that makes us feel good. One of our friends cooked the flank steak and was impressed with how fresh and red the meat looked (and tasted!). We'll definitely order more when our freezer gets empty! I love going to the freezer knowing it is full of Touchstone Angus Beef. It is makes meal time easier knowing I can come up with a good healthy meal for my large family quickly. I love browning Touchstone Angus hamburger. You never have to drain off the fat after you brown the meat and the taste is delicious. Our family had the pleasure of going to visit Brad and Cathy. They invited us to a cattle drive. We live in a city and knew really nothing about cattle. It was wonderful to see the care, dedication and science that went into caring for the Angus. The cattle also look so beautiful and happy and healthy. It was great for our family to see where their food was coming from and the difficult work it took to get it to our table. As parents it made us feel even more confident about our choice to feed Touchstone Angus grass fed beef to our family. I was a little nervous at first buying a ¼ of a beef the first time. I have 3 teenagers and I wasn’t sure they would like the taste as I have had other “natural” beef products and they have tasted funny and the kids won’t eat it. I decided to move forward with ordering from Touchstone because I wanted a healthy beef product and a great price. We have been so pleased and love the beef. My kids can definitely tell the difference between King Soopers brand and Touchstone. Now they ask if the hamburger is the good kind from Touchstone or the other before they will eat it. We have ordered many times from Touchstone as a result. I highly recommend their beef!! We love our grass-fed beef from Touchstone Angus. Everything came individually wrapped and labeled. I love knowing I’m feeding my family healthy beef and the cows were treated humanely. Thank you Touchstone! We've enjoyed the Touchstone grass-fed beef for several years. It has grass fed marbling fat which is more equivalent to fish oil but no "feedlot” corn fat that contains a much worse ratio of Omega 6 to Omega 3 oils (bad fats to good fats). Touchstone beef is especially tender and the marbling fat makes it tasteful. We highly recommend it. I had never tried grass fed beef but was interested because of all of the health benefits. In addition I was skeptical buying beef directly from a rancher I had never met. Not only was the taste much better than I had anticipated, the kids loved it. I feel better knowing I am preparing healthier meals for my family. Doing business with Brad James was a pleasure. I would rather do business with a person than a company. As long as Brad is raising cattle he will have my business. I will never purchase beef from a grocery store again. Brad James is a talented Cattle Rancher and we love his beef! It’s beautiful- red, tender and so tasty. I highly recommend you try out this great beef! We have no "beef" with you excellent beef. It is very tasty, delicious in fact, and less expensive than at a market, and because it is grass fed it is much better for our family. Also, it is always on hand in our freezer, especially in case of an emergency. Thanks again for your good service and beef. We have purchased grass fed beef from Touchstone Angus for four years now—and we plan to continue for many more. We love the taste, the health benefits and the fact that it comes from a local rancher. I love the convenience of having fabulous steaks, roasts and ground beef at my disposal all year long. It’s always a sad day if we run out of beef before our next cow is ready! Brad is always friendly and helpful when I have questions. I have recommended Touchstone Angus beef to all of my friends! Last year we began looking into organic foods as we became more educated on how cattle, chickens and produce are grown by the big industries. There is a real eye opening documentary out there titled "FoodInc" which made us all think differently on what we eat and where we purchase our food. Before we put in an order with you we tried a local rancher and purchased a small sampling of steaks to see how they taste and if they kids would eat them. After the first dinner - we were all hooked and anxiously awaited our order from Touchtone Angus. The serving portions and rich taste are something everyone in our family looks forward too. Now that we have a freezer full of really good beef, we all look forward to steaks, hamburgers and dishes we make like Meatloaf which has turned out to be a kid favorite. Last night we ate our first flank steak. My wife marinated it in an recipe we've used for flank steak before. The texture and taste/flavor were like nothing we've experienced from beef purchased at the store. We are hooked and look forward to becoming a long term customer. You will definitely hear from us next season. We have been purchasing a quarter of beef from Touchstone Angus for over 10 years. We began buying the grass-fed beef in 2006 and have thoroughly enjoyed it. There is a noticeable delicious flavor and texture difference and less fat as well. And as far as customer service goes, you won't find a more helpful partnership than with Cathy and Brad James.